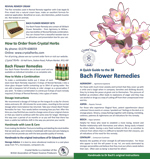 Our Bach Flower Remedy Collection Set contains all you need to start using the 38 Bach Flower Remedies. It makes for a wonderful resource, whether you're just starting out with the Bach Remedies, or whether you're an experienced user looking to expand your collection. A Complete Bach Set in a wooden box: all 38 Bach Flower Remedies - from Agrimony to Willow - and two bottles of Revival Remedy combination. Each remedy is at Stock Level and is handmade for you with love and care and preserved in organic brandy, helping to ensure that we provide you with the best possible quality of remedy. A copy of Dr Bach's book on his remedies - 'The Twelve Healers & Other Remedies'. A 30ml Revival Remedy combination spray. A 50gr pot of Revival Remedy Cream. Set Box A beautiful natural Linden wood box with hinged lid.